The DAGGER is a Titanium direct thread suppressor designed for use on semi-auto 300WM precision rifles. While it is rated down to an 18″ barrel in this magnum cartridge, it is also more than capable of suppressing any lesser round. 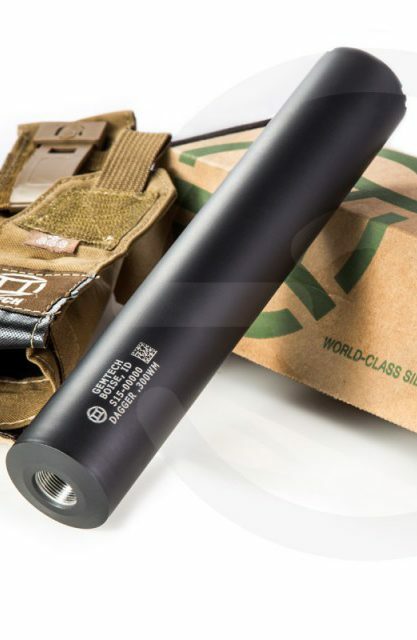 Currently available in 5/8×24 threads per inch, this is your “Average Joe’s” .30 caliber can and is rated for use on .308 SBR’s down to a 12″ barrel! If you have been a GEMTECH fan for any length of time (and if you haven’t you should crawl out from under your rock), then you will be happy to know that the old GMT-300WM that we all knew and loved got a makeover and legally changed her name to: DAGGER. Sporting the new GEMTECH logo endcap and Cerakote finish, she does her progenitor right.